Oracle client by default starts an implicit transaction for all the connections. 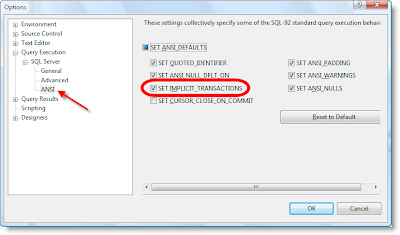 But in SQL Server by default implicit transactions are OFF which results in automatic committing of all queries which we execute in SQL Server Management Studio/Workbench. But there is a way by which we configure SQL Server 2005 Management Studio/Workbench to start implicit transactions just like oracle client. In the left side of the window, navigate the tree view to Query Execution/SQL Server/ANSI; displays a set of options on right side panel.